Disclaimer: I actually knit this about a month ago, but lazy git that I am, I am blogging about it now. Yep, because I’m on it! When I went to see Clara Parkes at MIT last month at the Common Cod Fiber Guild (which, seriously, what an awesome group of knitters), she spoke about how the specialness of a yarn makes for a more enjoyable knitting experience and an end result that you will love more, and really, have truer words been spoken? Knitting with the pigeonroof handspun was an exquisite experience, and the yarn has transformed an otherwise basic pattern into something magical. On the other hand, I am not sure about the Debbie Bliss. It was alright to knit with; I don’t have any complaints. It’s squishy, and I am happy with the texture more or less. I think I am having second thoughts about the color I chose. It kinda screams toilet roll cozy. Also, I don’t think the DB was as nice to knit with as say the Louisa Harding silk/wool blend I used to knit my mother-in-law’s Porom. 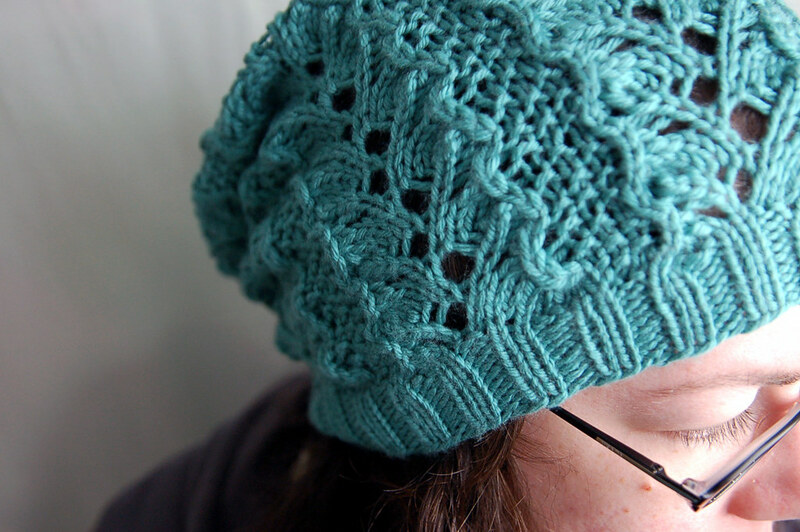 That project is a perfect example of a great combo of yarn and pattern, and the color is pretty spot-on, too. Funny thing, too, is that price-wise, I think the Louisa Harding was only 25 or 50 cents more per skein than the DB, which for a small project like a hat is really not a big deal and totally worth it. Back to the hat, though, I love the design. It is so very pretty! The only problem is that knowing how loosely knit to begin with, I should have gone down a needle size or maybe knit the fitted version of this hat instead of the slouchy version, because it is huge. I mean ginormo. Like, I know my head is massive, but this is humongous. When I first tried it on, my immediate thought was that I looked like one of the Martians from Mars Attacks! There are a plethora of jokes that could be made about that really, from the Jiffy Pop being ready to the Vatican going green. I like it and wear it a lot, however. I just need to wash it every couple of wears so that the ribbing tightens up again. I also don’t wear it with anything stuffed inside of it as in the photo I linked to, but you know, perhaps someday I will and hopefully start a new trend. I know what you mean about the specialness of the yarn… but I’m quote fond of this Debbie Bliss, and this color is fabulous! So maybe this one is just special enough :). This is fantastic on you! Would adding some elastic thread to the ribbing part help keep it’s shape? Just wondering.